Brain with lightning bolts. Three-dimensional computer graphic of a top view of a male head, with a human brain superimposed. Lightning bolts are seen passing through the cerebral folds of the brain in an abstract depiction of headache, migraine or epilepsy. The pain of a headache does not itself come from the brain, but from membranes around the brain and from the scalp. The pain is produced by tension in these structures. Migraine is a severe headache, often accompanied by visual disturbances and nausea. 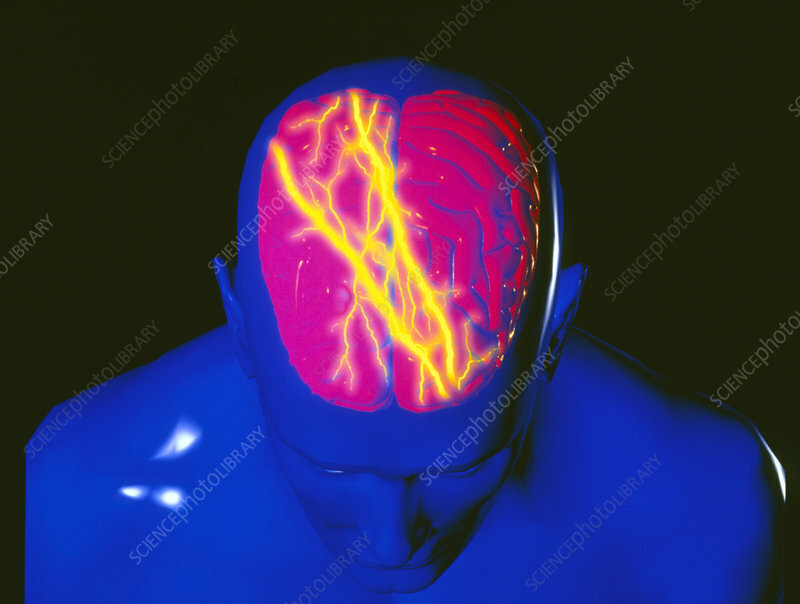 Epilepsy is characterised by seizures caused by chaotic electrical activity in the brain. Epileptic attacks can be triggered by a variety of factors.